"I am the mysterious masked student wrestler known only as Taurus Mask! I'll appoint you as my tag team partner, Brother!" I am the mysterious masked student wrestler known only as Taurus Mask! I'll appoint you as my tag team partner, Brother! The Main Event has begun! This one's my personal favorite! Just like a charging bull! No tricks from here on out, this is the real deal! Let the games begin! A great comeback, a great victory! We'll hit the major leagues in no time, Brother! Yo, brother! Today's weather is perfect for pro wrestling too. Let's show them the radiance of our tag team! Now, let's fight! He's usually the taciturn captain of a renowed athletic high school's wrestling team but he dislikes going out in public and blushes frequently. 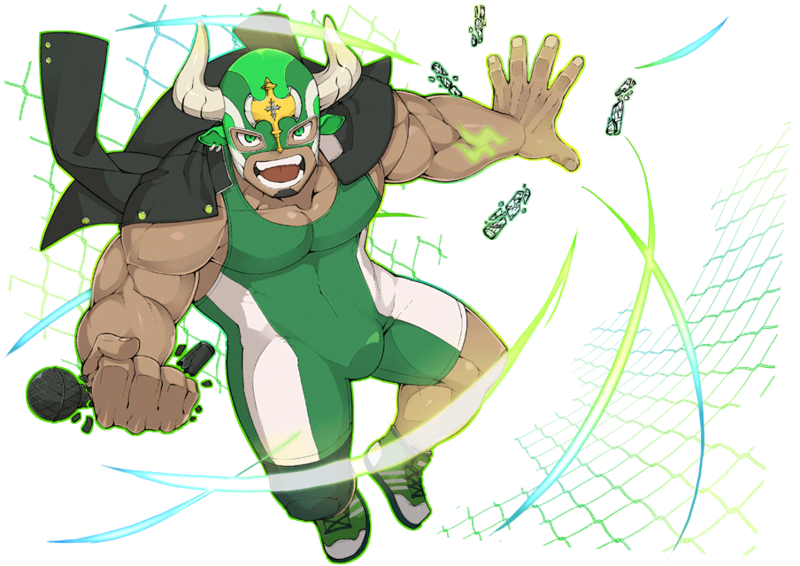 Once he puts on his mask, his personality spikes dynamically and he becomes the crowd-pleasing high school pro wrestler, Taurus Mask. 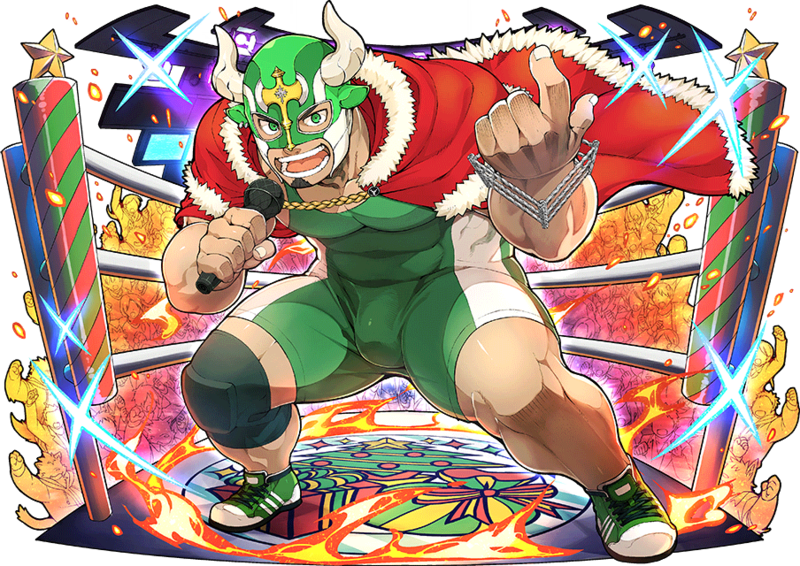 The civilian identity of Taurus Mask is a serious and reserved, but talented wrestling team captain at a school well-regarded for turning out sports stars. Ordinarily he suffers from terrible social anxiety, but when he dons the Taurus Mask guise he transforms into a boisterous pro wrestler well known for his vigorous spirit and showmanship. His Sacred Artifact is a string bracelet in the shape of his beloved wrestling Ring, where pro wrestlers cannot back down or hide from their oppenents. 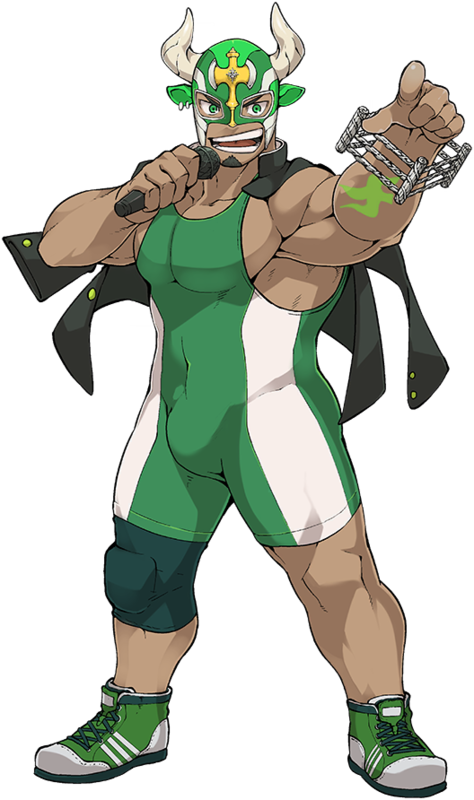 He is very active in the wrestling scene, constantly chasing after his (self-proclaimed) fated rival, and even taking part in the underground matches held by the Ikebukuro guild. As the (self-professed) inheritor of his favorite wrestler's legacy, there is not a day that he doesn't show up in a wrestling ring to express the soul of wrestling to as many people as possible. He has made many fans through his grappling techniques and MCs. The rope he carries is his Hallowed Artifact, which magically grows into a square battlefield from which there is no escape and no trickery. Following his (self-proclaimed) eternal destined rival he joined the Ikebukuro Berserkers, where he drives fans wild with the high-flying aerial finishing moves and MC performance that are the pride of the guild. It’s Tauruuuus Maaaask, happy Chriiiiistmaaas! The immortal hero of this holy night! I won’t make you wait… Brotheeeer! It’s the beginning of this Christmas festival! How romantic… Let’s go! I’m the raging bull of this holy night! Bull constellation, Corona Borealis! I dedícate this victory to you, Brother! Please, accept my burning heart! An exhibition party will be held on Christmas Eve, a wrestling tournament match celebrated in a high school, and the organizer and manager was Daisuke Ikusaba. Wearing his emblematic mask and a deep crimson coat covering his body, he is sure to blaze up the place with his passion on the mike on this Christmas Eve. And this time everyone is expecting a newcomer wrestler to partake on the exhibition. With his sharp eyes and his bravery, he doesn’t fear his opponent. On this night Taurus Mask will be the hero, and before the audience’s eyes, the heel’s roar will challenge him on a match he won’t lose. His full name is Daisuke Ikusaba (居草場ダイスケ). His masks depicts a double-bitted axe originating from Greece called labrys. The word is possibly ethymologically related to labyrinthos (labyrinth), which was a structure in Greek mythology to hold a minotaur. The star constellation Corona Borealis is considered to represent Ariadne's crown in the legend of Theseus and the minotaur in Greek mythology. I LOVE YOU SO MUCH, DAISUKE IKUSABA!! Daisuke is a pure boy. I need him! He’s so cute! Plus he’s drawn by Naop! This page was last edited on 16 December 2018, at 22:56.